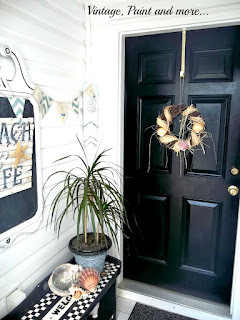 So this week - after all the end of school activities, graduation exercises and parties, and a visit from a special out of town guest - I decided to do a bit of tweaking and bring summer into our entryway. 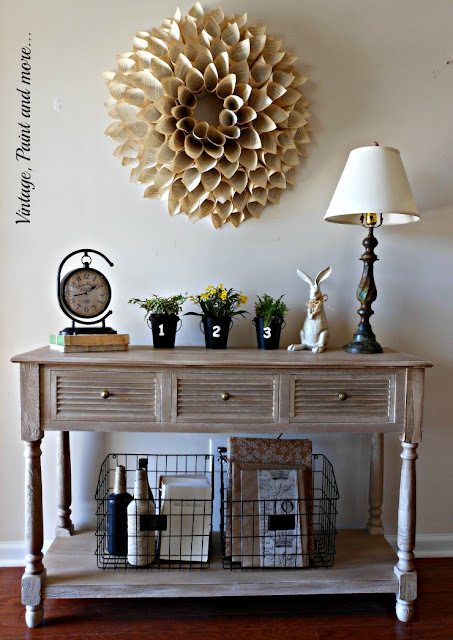 I felt it was time to finally take down all the Spring decor - you know all those cute little rabbits and eggs - time for them to go away till next year. I didn't do much to change it from Spring to Summer but it does look different. This is how it looked for Spring. And this is how it looks for summer. Not a lot changed but enough to make it more summery. Here's a closer look at the table top as that is where the changes took place. 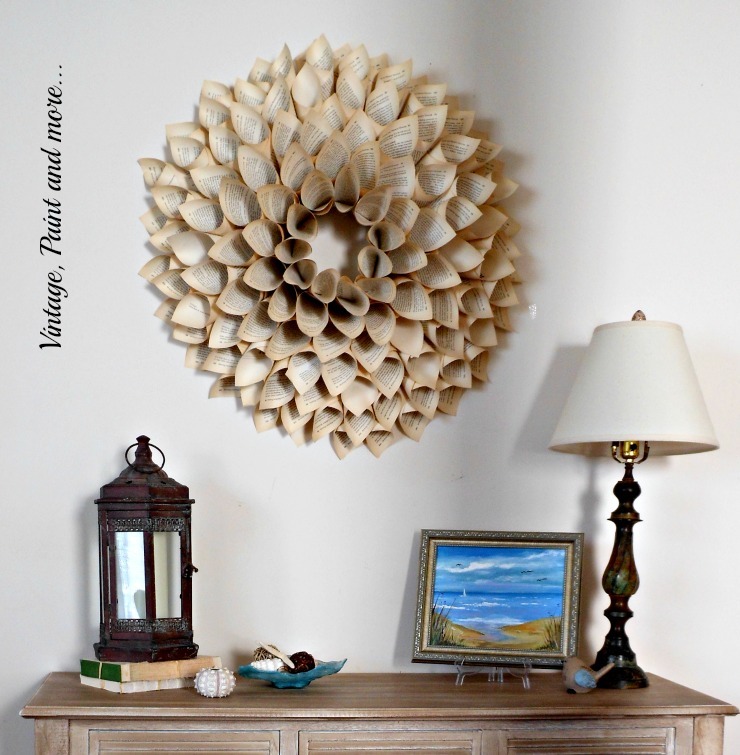 The book page wreath has taken up residency there and will most likely be there for quite some time. 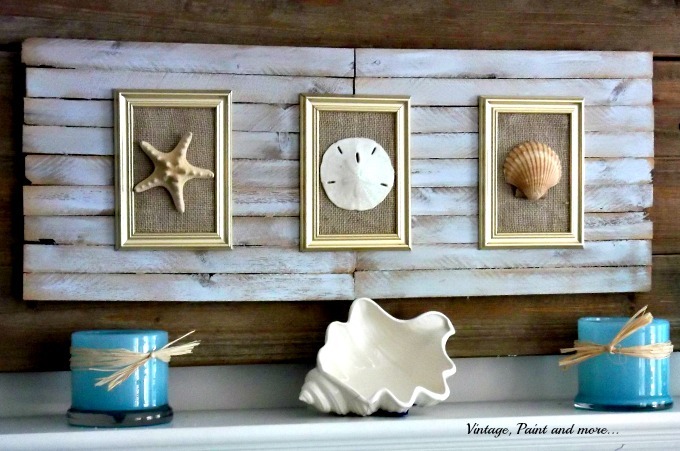 Since I am using a coastal/beach theme for the summer I just added a few pieces that portray that look. I love using the colors of the beach - all the blues, teals and whites are so soothing. 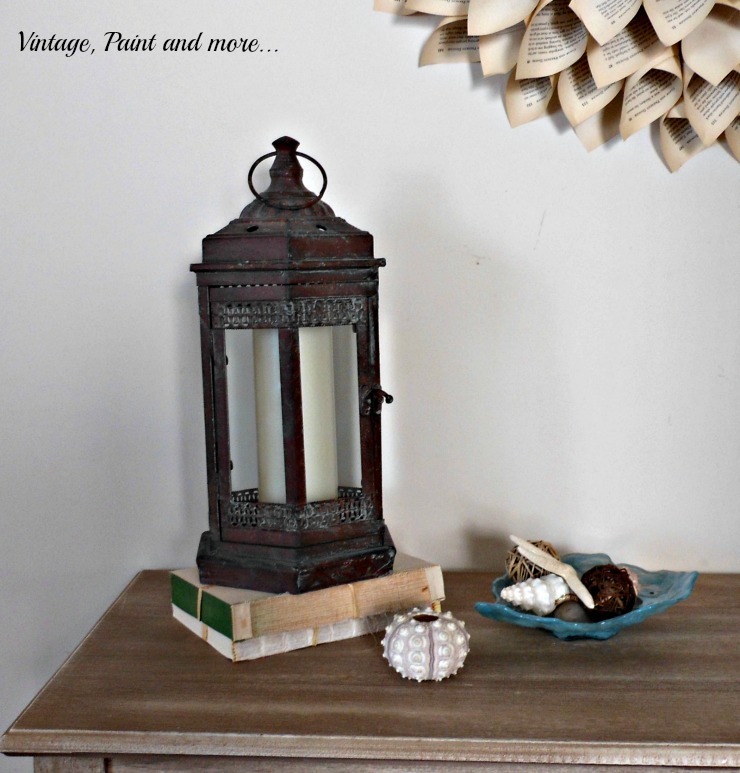 As you can see I placed a new "old" rustic lantern on a stack of books tied with raffia. I also added a blue shell dish filled with shells and sea glass. Then used a lone anemone shell along side. On the other side I merely placed a small painting that was done by one of the instructors at my son's store and a small brown bird. I kept the rustic brass antique lamp where it was. A simple tweak with only a couple of changes and I have a whole new look for the summer. 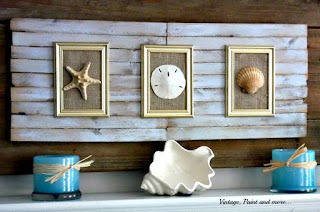 One that portrays the coastal/beach vibe I so love. What have you done to bring summer into your home? 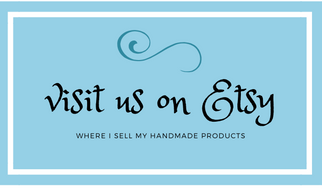 I love hearing from you so tell me about it in the comments below. I will be linking up to the parties listed on the Where I Party page. 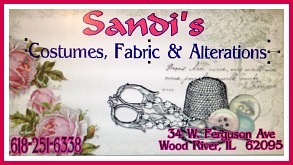 Please take a little time and visit these parties. You will find so much great creativeness and inspiration at each one. If you like this you might also like these. Love it! That is a great table too!! Thank you so much Debbie - I love that table - it was a gift from my son. Thank you for stopping by. I love the beach look! I tend to use it in several of my rooms! I guess I just wish I was there!! Thanks for giving us a look! I love the beach also - must be why we moved here, lol. I also love using the beach decor - so soothing and the colors are my favorite. Looks great. I am liking how full you have made the wreath - like a giant dahlia . 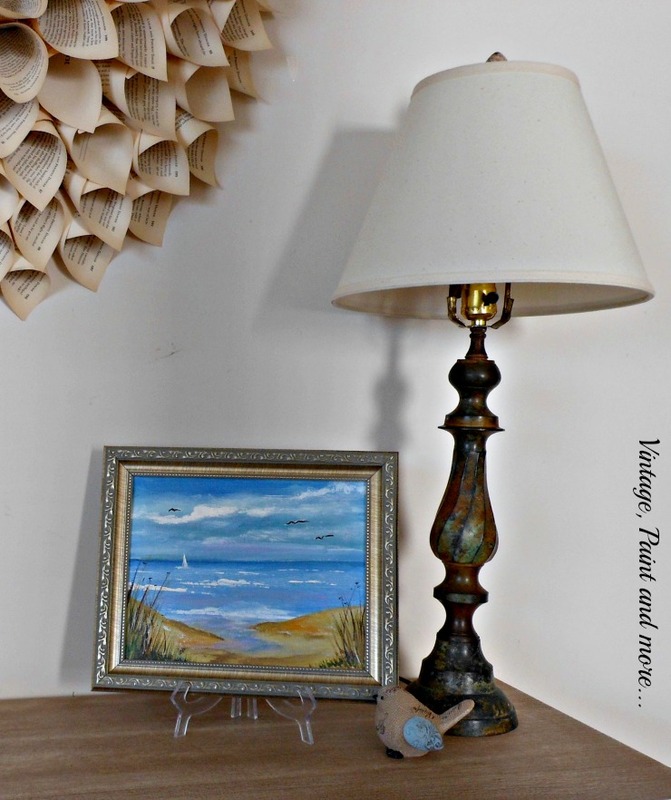 The small painting on the easel kicks the vignette up a notch. Visiting from Submarine Sunday. Thank you so much Susan. 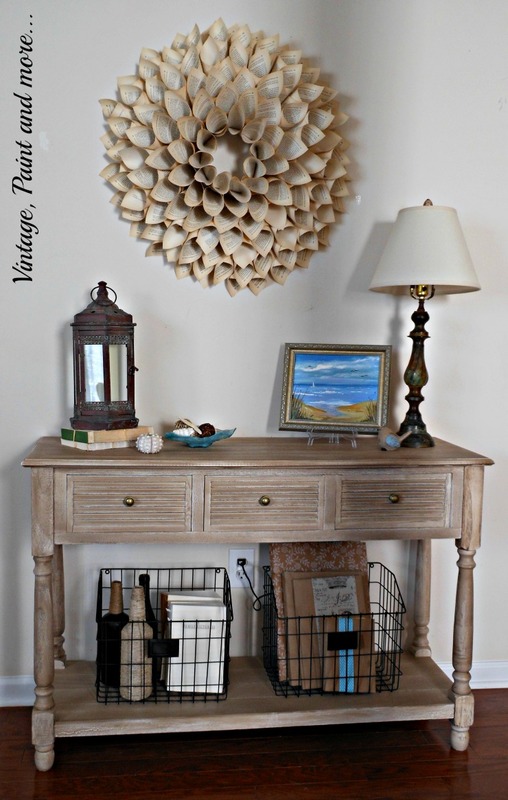 The wreath is one of my favorite projects ever and I love that little painting also. Thank ou for stopping by. I have been thinking of painting mine but now after seeing yours styled up, maybe I will just paint my mirror to match it. Thanks for linking up at the Table It Link Party, you're a doll! You know what they say Christine - great minds think alike, lol. I have thought about painting ours off and on also but have yet to do it. It will probably stay this way forever. Thanks so much for the party and thanks for your sweet words. 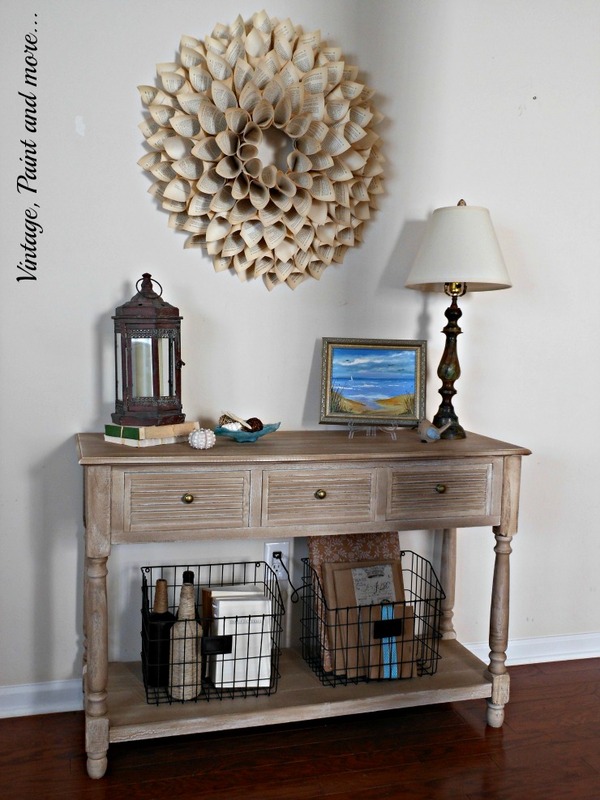 Your entry table looks great with all the summery things. Love the cone wreath, gorgeous!